I used to watch Dexter. I fell out of the habit after the second season; it wasn't that I stopped enjoying the show. I just lost track of it for a season or so, and when I started reading reviews of later episodes, I didn't have much interest in going back. It's a series with a fair number of problems, and those problems don't seem to be getting any better. Some, in fact, sound like they become appreciably worse. But even from the start, Dexter had one glaring flaw: the supporting cast. Dexter himself was fascinating, an often charming, sometimes creepy, surprisingly sympathetic serial killer. Michael C. Hall always did excellent work in the role, and just as importantly, the show never seemed to have much trouble finding ways to heighten his contradictions. Which is why it was always so disappointing when focus shifted from him to the people he worked with. Dexter's sister wasn't bad, and his nemesis (who suspected everything, but knew nothing) was hilariously pissed off all the time, but they were interesting largely because of their connection to the series' lead. Sub-plots about cops struggling with personal problems that didn't revolve around body disposal or blood slides were tedious, pointless, and frustrating. They seemed needlessly forced into the show, as a way to kill time while we waited for the real reason we were watching to show up. This is a problem that sometimes happens with series built around high-concept protagonists. House is another example. Even in the show's best seasons (i.e., the ones before I started writing about it), most storylines that didn't focus on House himself were by and large unnecessary. Maybe it's because it's far more difficult to make "normal" people interesting than it is to make freaks or geniuses compelling; maybe it's because they blew their budgets casting the lead and didn't put as much time and care into filling out the rest of the ensemble as they might have. It's certainly possible to do TV about a iconic central figure and fill their world with equally interesting secondary roles. For example, Buffy the Vampire Slayer did a terrific job of just that, to the point where you could argue that some of the secondary characters were better developed than Buffy herself. Maybe it's more that the main character of a show like Dexter or House has a certain advantage over the other characters: they're smarter, faster, funnier. They're special, while everyone else is just a regular grunt wallowing in the wake of their genius. Time spent away from the clever killer who knows what's really going on or the super genius doctor who always solves the case in the end is time wasted. There are ways you can deal with this. You can try and shoe-horn your lead into as much of the story as possible (House, because it's a procedural, generally manages this; you'll get a couple subplots each episode without him, but it rarely feels as painful as Dexter could be), or, like Buffy, you can try and buff up the supporting cast so that they're not always running three steps behind the hero. Or you can just accept that some scenes are always going to be more compelling than others, and just try and put together as entertaining a show as possible with the limitations at hand. That's The Mentalist all over, from what I can tell. Tonight's episode, "Red Queen" is the first I've watched all the way through, and it was an odd one to jump in on, given that it's a mythology episode. And it's a surprisingly complex mythology at that. Todd Johnson, a cop killer, was murdered earlier in the season while in police custody, and one of the show's regulars, Special Agent Madeline Hightower, is a primary suspect. So there's a lot of time spent on playing up that agent's temper, and the reasons she might have for killing Johnson; the episode even opened with an in media res scene that had Hightower apparently holding the hero, Patrick Jane, at gunpoint. The Corpse of the Week (ie, the murder that helps the show fulfill its duties as a procedural, so it can spend its spare time dabbling in serialization), an antiquities dealer found dead on a museum floor, initially appears to be completely disconnected from the Johnson case, until it's revealed that he was actually running guns as well as antiques; that he was high school buds with Todd; and that he provided Todd with the gun he used to kill police. It all comes together by the end, in a clever, if somewhat contrived, fashion. Not having a big emotional investment in the characters, it didn't even occur to me till late in the episode that Hightower was actually innocent; if I'd known anything about her character beforehand, I might've suspected some sort of trickery was afoot. (Or maybe not. One of my Twitter buds who watches the show regularly fell for the trick even while decrying its phoniness.) Johnson and the CotW were almost certainly murdered by the same person, and that person is currently working for the California Bureau of Investigation which the heroes call home. But it's not Hightower. At least, it probably isn't. Jane engineered his hostage-taking to help her escape, so he could prove her innocence and also to convince the real baddie to lower their guard. It's convoluted, sure, but it's fun convoluted; this isn't a drama that needs a lot of realism to work. It works a lot like the fake psychic act Jane used to run before Red John (the show's hidden antagonist) killed his wife and daughter. The trick is to surprise the audience by giving them what they want to hear, in slightly unexpected ways. The details aren't all that relevant. Mentalist was quite a bit of fun, in a pleasant, low-key kind of way, and the main reason it's so entertaining is that it has one of those protagonists I was describing before, the Highly Interesting Person. I'm not sure Simon Baker is as good an actor as Michael C. Hall or Hugh Laurie, but he's terrific as Jane, and it's the way he's terrific that sold me on the show early on, whether or not I really gave a damn about the mystery. Baker plays the part like he's hit that sweet spot of drunkenness, where everything is mildly wonderful and nothing's worth getting too worked up over. There's a playfulness to him that helps to undercut the bland professionalism of much of the rest of the cast. It's not exactly contempt; it's more the smirk of a man who knows this is all ridiculous and knows we all know it's ridiculous, but hey, just because it's ridiculous doesn't mean it can't be fun. HIPs often distinguish themselves by observing the characters around them as much as they participate in the action, which makes it feel like we're sharing some kind of secret with them. They're like an audience member who got to step into the world of the show. They know the tricks, they know the shortcomings, and there's a lot of pleasure to be had in watching them exploit those shortcomings. Admittedly, there's some darkness here. Jane is hunting the man who murdered his wife and child, after all. "Queen" did a decent job of hooking me into the mythology of the series, and the ending is one of those familiar "We're so close to the truth!" moments that's a little cheesy, but thrilling nonetheless. This is a very competently done piece of work, and I appreciated that; after watching The Closer and Blue Bloods, it's nice to sit down for an hour of escapist TV that isn't constantly tripping over itself in its need to generate histrionics or choking on horrible dialogue. While Baker is the best part of the cast, no one embarrasses themselves. The non-Jane scenes were well-paced, and the banter ranged from competent to occasionally inspired. Robin Tunney does good work as the female lead, although she didn't have a lot to do this episode. Of the rest, I liked LaRoche, the agent charged with tracked down Johnson's killer, quite a bit. I've seen the actor, Pruitt Taylor Vince, before, and he's always good; LaRoche is as weird, if not weirder, than Jane, and their scene together at the end of the hour was maybe my favorite part of the episode. I'd like to come back to this show. My Thursday nights are busy, TV-wise (I had to sacrifice 30 Rock for this), so I might have to wait for reruns, but this is the kind of effective, no-pressure television my life has been missing ever since House went to crap. 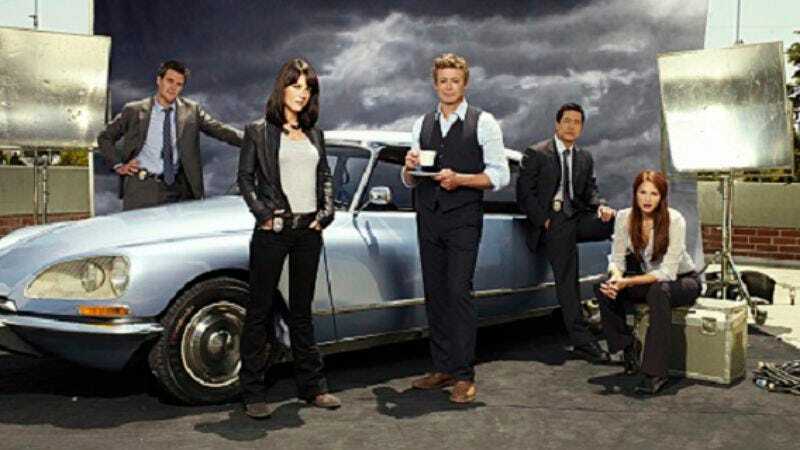 There are other procedurals on the air right now, and some of them are better than this, but The Mentalist manages to handle the imbalance of the HIP lead with aplomb. Even better, there are all these odd moments flitting around the edges. LaRoche has Hummel figurines, for god's sake, and he wears pajamas, and he has an adorable small dog. The CBI's man in charge likes to randomly quote William Blake when the moment finds him. (I'm betting this is a clue that he's the one who killed Johnson, but who knows?) And then there's Jane at the heart of it, just far enough off center to make the weirdness seem like truth. I doubt this series is ever to go full Twin Peaks, but I dig the idea of that sense of humor never quite leaving the frame. It's a cop show that's more than happy to remind us of the absurdity of cop shows. Not a bad trick, that. For people who've been watching the show from the beginning, how well has it handled the Red John storyline? Is it still involving, or are you getting close to "DAMMIT WHEN DOES HE MEET THE MOTHER" frustration levels? "Maybe they don't speak Spanish." "Maybe you don't speak Spanish." Exchange of the night: "I bet you won a few science fairs." "Hm. I won all of them."